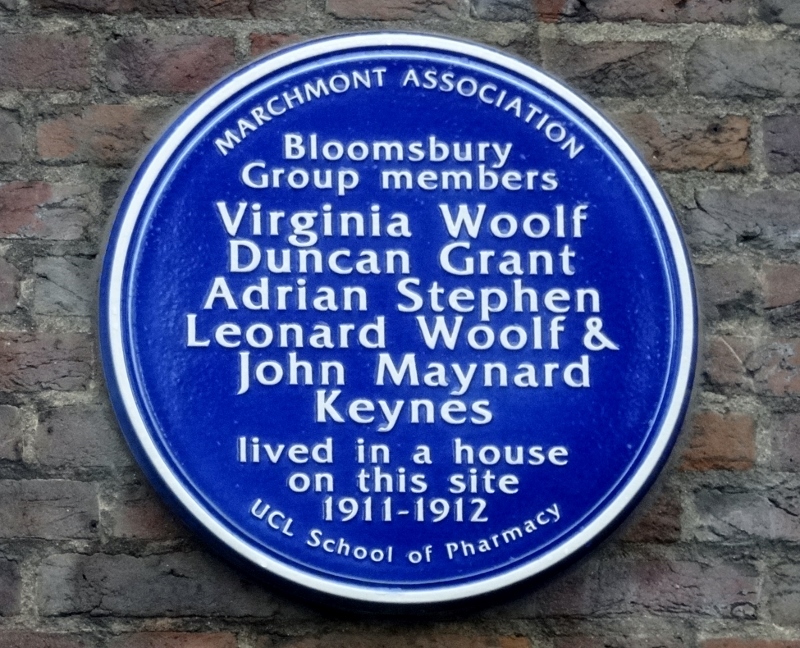 Simon Keynes, the great nephew of economist John Maynard Keynes, has unveiled a Marchmont Association (MA) plaque commemorating five members of the famous Bloomsbury Group, who lived at 38 Brunswick Square in 1911-12. The plaque is installed on the UCL School of Pharmacy building, which replaced the original Georgian house lived in by Virginia and Leonard Woolf, the artist Duncan Grant, John Maynard Keynes and Virginia’s brother Adrian Stephen. Virginia and Leonard were married at St Pancras Registry Office whilst living there and Virginia’s life was saved by Maynard’s doctor brother, Geoffrey, when she attempted suicide whilst staying there a few years later. She survived the ordeal and went on to write her most famous novels. The unveiling was also attended by representatives of the Virginia Woolf Society of Great Britain, and Charleston, the country house frequented by the most prominent members of the Bloomsbury Group. The event was also supported by several MA Members. The Marchmont Association is grateful to UCL School of Pharmacy for allowing us to install the plaque on their building and for sponsoring the plaque and hosting the very civilized ‘tea & cakes’ reception afterwards. In what is clearly going to be one the biggest issues in our neighbourhood over the next year, Camden Council has begun a trial of new traffic arrangements along the Torrington Place-Tavistock Place route between Tottenham Court Road and Judd Street. Wider cycle lanes are now in place on both sides of the street and there is only single lane motor traffic westbound and eastbound from Gower Street. Leaflets explaining the trial scheme were delivered to all affected residents and businesses in week commencing 26th October, with the preparatory works taking place from the 6th to the 23rd November. The trial scheme will run for 12 months, during which it will be monitored to assess the impact on air quality, traffic, pedestrians and cyclists. Stakeholders (residents and businesses) will also be consulted in early 2016. The Marchmont Association will be arranging a public meeting halfway through the scheme to allow local people to have their say. If the trial shows that the changes have been positive and there has been support for the scheme, the Council will consider making the arrangements permanent, intruducing wider pavements and improved crossings. For the moment we remain neutral on the scheme. We’re aware of some local residents that use cars finding it more difficult to access shops and park, and cursing the inconvenience of having to use more circuitous routes to reach the same destination. Others are pleased with the new pedestrian and cycle friendliness of the street and how a traffic snarled rat-run for the Euston Rd has been transformed into a pleasant and much quieter public space. So far residents on Judd St have noticed more traffic, and there are clealry a lot of confused drivers getting lost in side streets. The situation in late November wasn’t helped when Thames Water dug up the eastern side of Judd St, diverting traffic into Leigh St. But we need to to wait to see how the scheme beds down. To find out more, go to http://www.camden.gov.uk/torringtontavistocktrial. You can also comment on the trial scheme via: torringtontavistocktrial@camden.gov.uk.